Jonathan Kuttab with Just Peace Advocates coming to Peterborough. I’m going to plunge into a topic that is fraught with division and deep trauma on all sides. It is the situation in Israel, particularly the behaviour of the government of Israel, and what it has done and is doing in Gaza (population 1.8 million) and the West Bank (2.5 million), which are “occupied territories” holding Palestinians. 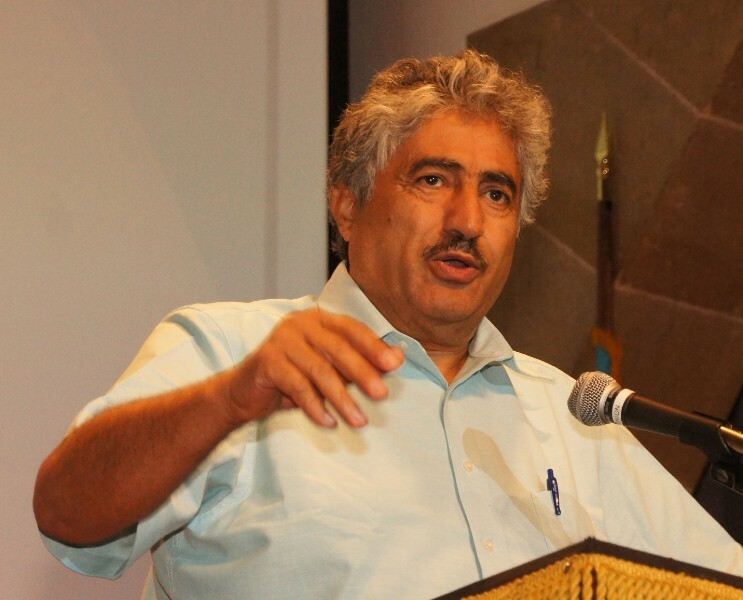 I listened to the testimony of a highly educated and compassionate spokesperson for the Palestinians this week at Sadleir House, Jonathan Kuttab. He is a lawyer, who recently was guest professor at the York University law school. He is a Christian Arab, born in East Jerusalem, now based in Jerusalem. Critics of the policies of the Israeli government, and there are plenty in Canada and around the world, including the Israeli newspaper Haaretz, face the possibility, nay probability, that they will be labelled “anti-Semitic.” Or, if they are Jewish, they will be called “self-hating Jews.” But name-calling cannot become a reason for reticence when one looks at the massive, long-standing and ultimately cruel occupation, and denial of basic rights in the two shrunken areas. The United Nations has been warned that Gaza, (40-by-six-kilometre) is expected to be “uninhabitable” by 2020. Electricity is on four hours a day. The barrier is a wire fence, backed up by armed Israeli soldiers. Food is very expensive. Water is often contaminated. A Gazan hospital was bombed in 2014. Unemployment is 40 per cent. A Peterborough group headed by activist Margaret Slavin is in touch with a family in Gaza and knows the daily deprivation it suffers. Kuttab offered his listeners slides, maps and some history. After the Second World War, in which Europe tore itself apart and then faced a dreadful acknowledgement of the Holocaust, during which six million Jewish citizens of several countries were killed in death camps, there was a global feeling of revulsion, guilt and shame. So in 1948, the British government, which had been in charge of Palestine, decided to make the territory a homeland for the Jews. Except that it was already home to four million Palestinians who had no say in the matter. This was the Balfour Declaration. Then came simmering resentment and some armed resistance. For 70 years, attempts at finding a solution failed. Twenty-five years ago in Oslo, Norway, leaders came up with the “two-state solution.” It might have worked, but separation was not so easy: Arabs were living among Jews everywhere. Progressive Israeli prime minister Yitzak Rabin was assassinated by a religious fanatic. The pain in Kuttab’s presentation regarding the suffering of Palestinians was breathtaking, but equally so was the utter absence of vengefulness or hatred. He is convinced, as are many Israeli writers and citizens, that the imprisonment they are administering has the effect of imprisoning them also, and corrodes the long-admired Jewish conscience. Israel is a nuclear power. We have seen pictures of boys with sticks and rocks being fired on by heavily armed soldiers. Prime Minister Benjamin Netanyahu, a hawk, is further empowered now by Donald Trump. Illegal settlements in the West Bank now house 700,000 Israelis. Israeli’s neighbours, Syria, Egypt and Jordan, must pledge to respect its right to exist in safety. Israel is a democracy with freedom of speech and of the press. Small steps in regional co-operation are needed. So is a conviction among Israeli leaders that justice for its Palestinian minority is crucial. Many lives depend on it. NOTE: Reframe Film Festival will show a documentary entitled “Naila and the Uprising,” set in Gaza, on Friday at 1 p.m. at Showplace. Visit www.reframefilmfestival.ca for details.